I had an earlier article before wherein I described the different types of ferries sailing the Philippine waters and one of that is the short-distance ferry which connect our near islands through our straits and channels and sometimes through our small inland seas like the Camotes Sea. In this article I would like to expand the discussion on them especially on their safety and their other qualities and characteristics. And to clarify what is a short-distance ferry and to distinguish them from overnight ferries I will make the presence or absence of bunks as the distinguishing characteristic. I have always used the term “basic, short-distance ferry-RORO” and I would like to connect it here since many of our short-distance ferry actually belongs to that type. Basic, short-distance ferry-ROROs are the ROPAXes (RORO-Passenger ships) that have just one car deck and one passenger deck above it and access to the car deck is almost always through a ramp located at the bow of the ship. Usually their lengths ranges from a little under 30 meters to a slightly over 40 meters and they are just powered by a single engine and the usual speed is between 9 to 11 knots. Some of these are in the classification of “double-ended ferries” which are bows on both ends and has two propellers both aft and abeam. But not all short-distance ferries are basic, short-distance ferry-ROROs. Among our short-distance ferries are the ROPAX LCTs which are cruder, less comfortable and slower than the basic, short-distance ferry-ROROs. If the latter are mainly built in Japan, the former are mainly built in the Philippines although in the recent years more and more are coming from China. In this article the Cargo RORO LCTs are not included because technically those are just vehicle carriers and not allowed to carry passengers (and hence are not ferries) although the crews of the trucks and the driver of the sometime small vehicle like cars are also carried aboard them. We also have a few remaining short-distance ferries that are not ROROs (Roll-on, Roll-off ships) but are instead cruiser ships. This type carries passengers and some cargo but not rolling cargo or vehicles as this type do not have ramps nor car decks. While these were more in number a few decades back, these are now on the way out being obsolete already. The rolling cargo is now the primary source of revenue in the short-distance routes and is more important revenue-wise compared to passengers (an exception maybe in many cases are the bus passengers because they are many but in many routes also they are subsidized by the shipping company). Cruisers cannot compete head-on now against the ROROs and the few operators remaining are just using the last few years of the serviceable life of the cruisers (rather than chopping or breaking them up Immediately). It is actually just in Zamboanga where cruisers still has significant presence and there are still some cruisers in Cebu but they are mainly overnight ferries. However, we also have short-distance ferries that are fast and these are the High Speed Crafts (HSCs) consisting of the fastcrafts and the catamarans. These types do not carry vehicles, only passengers but since they charge double on the average that keeps them viable although since these have overpowered engines the margin for profitability is thin. That is the reason why some are not sailing anymore and some just sail on peak months. These types do not sail on every short-distance route but only on high-density routes where the passengers are willing to pay higher for the faster and more comfortable ride. Among the major operators of this types are Ocean Fast Ferries (or Oceanjet), 2GO (the SuperCats but now renamed after archangels), SRN Fastcraft (or Weesam Express), the Star Crafts (which are under two companies) and Montenegro Shipping Lines. There is also one operator of this type in Manila for Corregidor tourists, the Sun Cruises/Prestige Cruises. We also have crafts that are similar to High Speed Crafts but are not that fast and these are the Medium Speed Crafts (MSCs). These are also found in the short-distance routes but like the HSCs these are not found in every short-distance route because these also charge higher (and as high as HSCs). One characteristic of the HSCs and MSCs is their passenger accommodations are generally air-conditioned although most have open-air accommodations too for passengers on short budget. The most significant MSCs of the recent years are the FastCats of Archipelago Philippine Ferries which are actually catamaran-ROROs and hence can carry vehicles. In the past, it was motor boats (called motor launches now) and motor bancas which were our short-distance ferries. Now the motor boats are already gone by and large because of administrative fiat but a few relics remain. There are much more passenger-cargo motor bancas remaining especially those connecting the small islands and islets where the use of a steel-hulled ferry is not yet viable. Motor bancas with their smaller engines, lightweight hulls and the small capital needed can’t just be driven away because they can sail profitably on light routes. An administrative fiat is actually dangling over their heads (or is it hulls?) but for sure they will always stay as connection to our so-many islets where a steel-hulled ferry is uneconomical to operate. Motor bancas can land on bare shores, an almost impossible task for a steel-hulled ferry. However, the loss rate of these wooden-hulled ferries are much more than the steel-hulled ferries and that is the reason for the administrative fiat. The safety of these short-distance ferries has always been called into question including very recently. There has always been the presumption or conjecture that since these are small and older (not the HSCs and MSCs, of course)) then they must be more vulnerable which is a queer linear thinking not supported by facts and history. I have in another article already conceded that wooden-hulled ferries that even lack the basic safety equipment are really more vulnerable and will even sink without a storm especially the motor bancas. Lack of safety is not attached to the HSCs and MSCs because they are more modern and they might correct in that but my data can throw some doubt in that. But to attach lack of safety in the short-distance ferries, which are actually many in number and sail seas that are even more turbulent than what liners and overnight ferries sail in is actually highly incorrect, if only people including those in government will study the records. Pro rata, the liners and the overnight ferries sink at a faster rate than them. Our short-distance ferries are actually safe, relatively speaking. Conjectures and failure to study records (or even collect records) cannot substitute for concrete analysis. Now if I will make an exception to this defense it will be about Besta Shipping Lines of Batangas which is engaged in short-distance ferry operations but which has already lost half of their fleet. In short-distance ferry operation, this company has clearly the worst record. Our steel-hulled short-distance ferries have been here already for nearly four decades, a long time to establish if they are safe or not. They are not small in number, they clearly outnumber the liners and overnight ferries but only a few of them has actually sank or was lost while sailing. I will separate the ferries that sank in storms while not sailing as that can be considered force majeure or as they say in insurance, an “act of God” and does not speak of safety as any ship can get caught in storms through no fault of theirs that passed through their area. I think what happened to the ships beached, wrecked or capsized by the super-typhoon “Yolanda” is a good recent example of what I am saying. When the storm surge comes along with the winds, the ships can get beached, wrecked or capsized. That is also what happened to Cebu ships in Typhoon “Ruping” in 1990. Among the ferries caught by storms not sailing that are not wooden-hulled are the Baleno Six of Besta Shipping Lines (beached and wrecked in 2006), Ivatan of BMPC (wrecked in the 2000s), Northern Samar of Bicolandia Shipping Lines (sank in port in 2006), Sta. Penafrancia 7 of Sto. 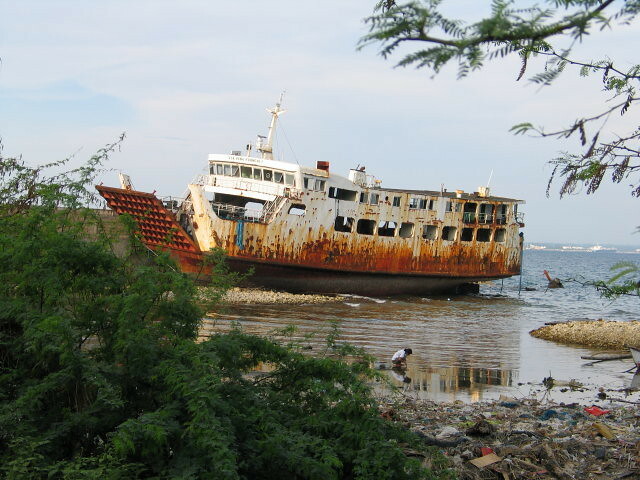 Domingo Shipping Lines (beached and wrecked in 2006) and the Super Shuttle Ferry 17 of Asian Marine Transport Corporation (capsized in port in 2013). None of those were salvaged anymore unlike the Shuttle Fast Ferry of Asian Marine Transport Corporation which was also caught in a storm. Again not much safety questions can be attached to their losses and can just attributed maybe to bad luck. In all the mentioned incidents there were no passenger casualties. There are also steel-hulled short-distance ferries that were lost while maneuvering in a storm but not carrying passengers. Among these are fastcraft Delta I of DIMC Shipping and the Starlite Atlantic of Starlite Ferries. The first was forced by MARINA to move and she grounded while seeking shelter in Bohol in 2012 while the latter maneuvered out of her own volition at the peak of a strong typhoon and capsized in 2016. I do not really know how to classify the two except that I know it is highly dangerous to maneuver in a storm, with passengers or none. Whatever, in the second, the captain bears a lot of the blame while in the first it is highly disputable where the blame really lies. In the latter there were casualties. Then there is also the case of two short-distance ferries which were struck by tragedy while in port but were no longer repaired (but they were still repairable) because their companies were already losing then. These are the Ruperto Jr. of Tamula Shipping which caught fire in the 1990’s and the Dona Ramona of Basilan Lines which was bombed with casualties in a terrorist act in 2005. The two did not sink but they never sailed again. Fires and bombings happen but the two were lost through conscious decisions on the part of the owners and would not have been totally lost in a normal situation. This is just like the loss of ferries like those of Tamula Shipping which just rotted and sank in port after the owner declared bankruptcy and ceased operation. In contrast with this was the firebombing that happened aboard the Our Lady of Mediatrix of Daima Shipping. The ship was repaired and she is still sailing as of now. And another case of a slight mishap that was not repaired again was the Starlite Voyager of Starlite Ferries that was broken up after a grounding incident. In this last case, a navigation error happened. There are also short-distance ferries which capsized in port while doing cargo handling and which were no longer salvaged and repaired. These are the LCT Davao del Norte of the Province of Davao del Norte and the first Ciara Joie of Aleson Shipping Lines. The first happened in the 1990’s while the second happened in 2003 and it is a mystery to me why they were no longer salvaged when they were in shallow waters and just near land. There were no passenger casualties from both incidents. And maybe we can add to this another one lost in port because of neglect and and the hull was holed and the ferry sank in shallow waters. This is the Super Shuttle Ferry 2 of the Asian Marine Transport Corporation which was languishing in port for several years before the holing incident. And there was another ferry wrecked just off port when it grounded as was just neglected. This was the Baleno Tres of Besta Shipping Lines. In the two neglect cases there were no casualties either. Then there are the case of two short-distance ferries (or at least used as such since one has bunks) that were both in distress and threatened with sinking but both reached port and capsized in shallow waters. These are the Ocean King II of Seamarine Transport which was hit by a rogue wave and the rolling cargo shifted but managed to reached port and the Baleno 168 of Besta Shipping Lines in which the propeller broke away and water entered the hull but which reached port too. The first happened in 2009 and the second happened in 2013. The first was no longer salvaged and repaired while the second was salvaged and repaired and when she came out of the shipyard she was already a RORO cargo ship. There were no casualties from both incidents although in the first the Coast Guard made a big show on how to conduct rescue wrongly. There were two other short-distance ferries that were lost but did not really slid beneath the waves in the truest sense of the phrase. One is in shallow waters, the LCT Gwen Vida of Jomalia Shipping, a possible victim of another cargo handling mishap. Another was the burned San Miguel de Ilijan of Viva Shipping Lines which was supposedly towed to port. Up until this point there was no case of a short-distance ferry that actually sank beneath the waves except for the Starlite Atlantic and the LCT Gwen Vida. In the Starlite Atlantic she was the only one with casualties aside from the Dona Ramona that was bombed. And that leaves us with 8 short-distance ferries that actually sank plus the wrecked SuperCat 1 which hit an underwater object while running at full speed in 1994 (the vessel was retrieved but it was too damaged for repair). There was no dead from that incident. Two of the nine are High Speed Crafts, the Delta Cat II of DIMC Shipping and the Island Fastcraft I of Island Shipping which bring to 3 the number of lost High Speed Crafts including the Delta I (it seems for their small number the total of 3 is no longer small). The Delta Cat II sank while on trials and Island Fastcraft I caught fire, the only second short-distance ferry that sank due to fire. So it seems fire is not that major risk among short-distance ferries and Island Fastcraft I was a casualty owing to the nature of its aluminum hull which burns fast and gives off toxic fumes. 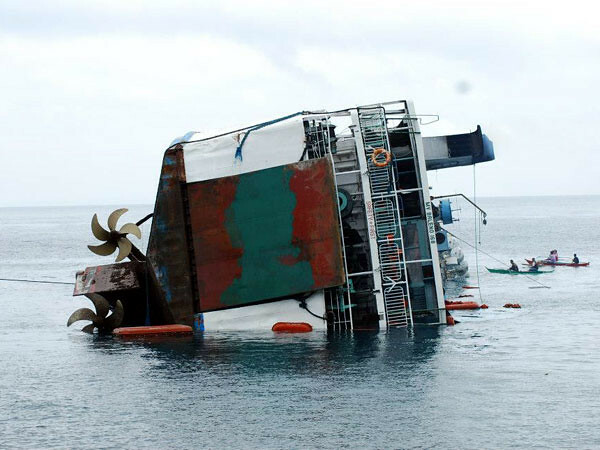 The Delta Cat II sank in the late 1990’s without casualty while Island Fastcraft I which sank in 2011 had some casualties even though rescue was only nearby. Among the rest, one capsized and sank in worsening seas because of stalled engines and rescue did not come even though it was just nearby, a clear case of irresponsibility. This is the Maharlika II of Archipelago Philippine Ferries which was lost in 2014. So stalled engines seems not to be a major cause of losses among short-distance ferries. Baleno Nine of Besta Shipping Lines which was lost in 2009 and the Lady of Carmel of Medallion Transport which was lost in 2013 are both basic, short-distance ferry-ROROs which sank quickly in the night, both with heavy casualties relative to their number of passengers. 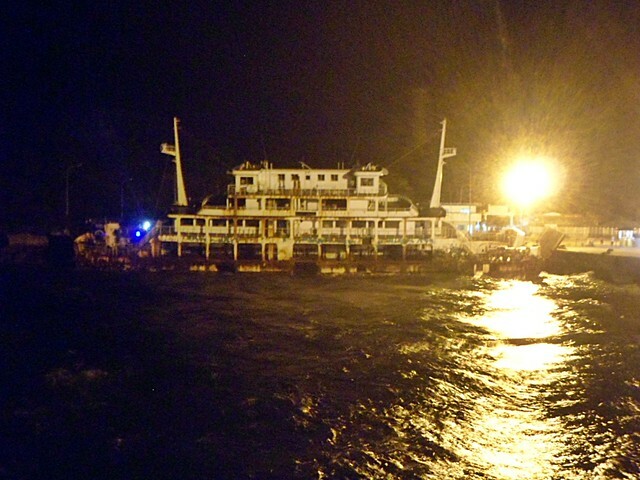 Night is additional danger to passengers in sinking especially if the ship is gone fast. Uneven loading is one of the factor being eyed in the loss of the two ferries. Ivatan Princess, a small, short-distance ferry was also another ferry lost at sea, she sank but apparently like the Delta Cat II she was not carrying passengers at the time of the sinking. Technically, they were sailing because they were not in port. Which now leaves three more ferries that are all Batangas-based. Batangas has lost many of the short-distance ferries and just the repetitive report of the Baleno ferries of Besta Shipping Lines emphasizes that. 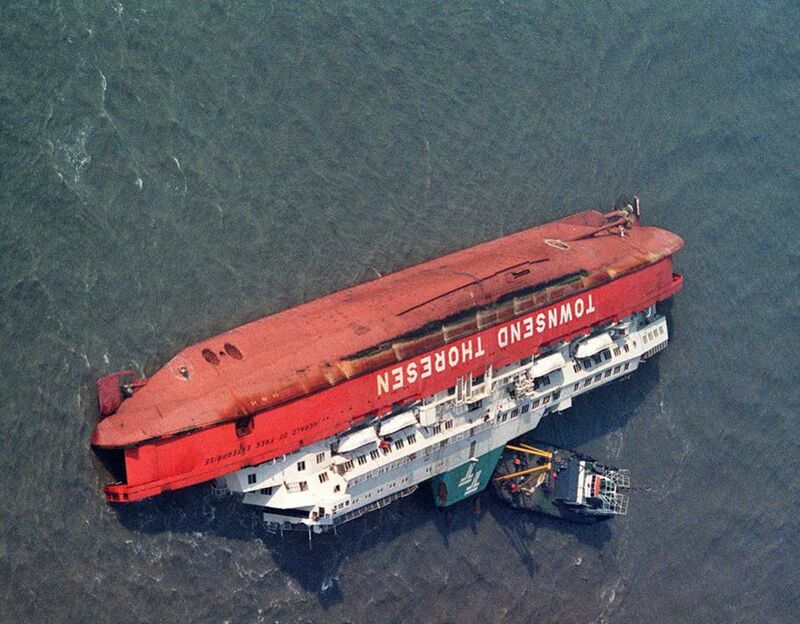 One of that was the Emerald I lost in 1991 when heavy seas overwhelmed her when water swamped into her low sides and stern and actually that might have been the only loss of a short-distance ferry in foundering. That has similarity to what happened to Ocean King II later which somehow survived. Low sides is a danger to ferries especially in ROROs and that is why more recent ship design feature high sides. 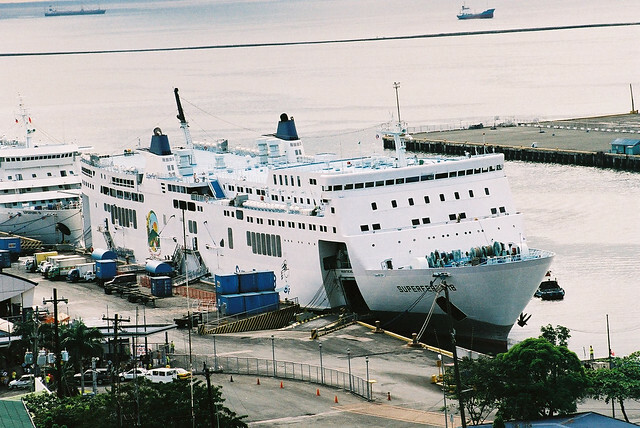 Another Batangas ferry lost was the Viva Penafrancia II of Viva Shipping Lines which hit a fish corral in 2000 which meant a navigation error. And the last is Ruby I of Alexis Shipping which sank fast in mysterious circumstances in 1993 and there were charges of sabotage like in SuperCat 1. The total of short-distance ferries that actually sank is actually smaller than that of the liners and the overnight ferries when in number they are far greater. And so that means they are relatively safe. Or restated, the bigger liners and overnight ferries are actually more unsafe, take your pick of the formulation. They are not as vulnerable to fire like the liners, the don’t get caught by storms as much as the liners too. In resisting storms while not sailing they seem to be more vulnerable, however, and ditto for strong seas which are not mysteries. If one will notice none of the short-distance ferries was lost due to a collision so saying their bow-mounted ramps is a liability does not have foundation anyway. Actually collision on Philippine seas are rare. It is just disproportionate in the minds of the people because of the ghastly casualties in the loss of the Don Juan and the Dona Paz. They are also not that weak against foundering which is a disease of our liners. So are our short-distance ferries safe? Yes, they are even though they might look small and vulnerable. If one calls them unsafe then he or she should be prepared to calls our liners and overnight ferries as more unsafe, if he or she knows any logic. So don’t pick on the short-distance ferries, please. Many except for those from the Central Visayas do not know that Ocean Fast Ferries, more commonly known as Oceanjet is already the Philippines’ largest operator of High Speed Crafts or HSCs. This is especially true in Luzon which has only been recently exposed to the Oceanjets when they invaded Batangas. Therefore, many think that the old king SuperCat is still reigning because the ads and glitz are still around and they still have the best booking service and so foreigners and tourists easily find them online. Being connected to 2GO doesn’t hurt them either. Oceanjet actually did not start very late as some might surmise. They only came a little later than Bullet Express and SuperCat and almost about the same time as Waterjet and the Sea Angels of Negros Navigation. They were even a little ahead of SRN Fastcrafts (which is more popularly known as Weesam Express) which started in Zamboanga and the SeaCats of ACG Express Liner. All of those mentioned actually came only in the mid-1990’s. The Montenegro Shipping Lines fastcrafts came significantly later than them and still much later did Star Crafts and Lite Ferries started operating High Speed Crafts. Ocean Fast Ferries did not start with a bang. Neither did they expand very fast and they were actually on the conservative side. The other HSC operators were overly ambitious and they paid for that mistake. Some coalesced, some were driven out of business. Because of the fast expansion of the High Speed Craft sector, there came an instant overcapacity in the late 1990’s. Filipinos are still poor and so the fare is a big decision point for them. Most are not willing to pay fares of the HSCs which in general were double the fare of the ordinary ferry. The reason for this is HSCs gobble a lot of fuel because they have oversized engines plus they don’t carry a significant amount of cargo. Since Oceanjet did not expand fast in the early days of the High Speed Crafts, they were able to avoid the mistakes of their competitors. They only started expanding in 2001 when the dust of competition in the HSC sector already started to settle. The Ocean Fast Ferries expansion seem to come in batches. In 2001 to 2003, their brand-new Oceanjet 3, Oceanjet 5 and Oceanjet 6 which were all sister ships started arriving from their builder Cheoy Lee of Hongkong. These were the first brand-new HSCs for Ocean Fast Ferries as the Oceanjet 1 and Oceanjet 2 which they acquired in 1996 were just bought second-hand from Japan. These trio of sister ships brought success and recognition for Ocean Fast Ferries. They were not that fast (as in sub-30 knots while the SuperCats and Weesam Express fastcrafts were capable of speeds over 30 knots) but they were big and high. It seems these trio started a design template for Ocean Fast Ferries. Moreover, the trio also started the engine combination favored by Oceanjet which is a pair of Cummins engines with each developing 1,800 horsepower for a total of 3,600 horsepower and a speed of less than 30 knots. While not that that fast the engine combination saved fuel, the parts are easy to source (Cummins has a depot in Cebu), engineers are familiar with it and Cummins is a good engine make. Oceanjet was also not fond of waterjets for propulsion and instead relied on the trusty propeller unlike some of their competitors. Waterjets are also more maintenance-intensive and it can foul in the dirty waters of our ports especially in Cebu and that can send schedules awry when an engine can’t propel because its waterjet sucked in garbage. They tend to consume more fuel too. Of course in speed they are matchless. The speed where waterjets become inefficient (that is when it can’t push anymore even if more fuel is added) comes much later than that of a propeller. It took seven years before Ocean Fast Ferries acquired another High Speed Craft after that trio of sister ships. In 2010, they purchased the Oceanjet 7, an old but gold Westermoen catamaran. This was the first cat of the company and it was an antithetical acquisition. Maybe they were attracted by the solid and high reputation of a Westermoen. Maybe it was the price that attracted them. Or a combination of that and the reputation. I really don’t know. Suffice to say this old cat proved its value to them and is still reliable. One big supplier of High Speed Crafts in the world especially aluminum-hulled ones is Australia. It came naturally for them as they are a boating country and they were once the king of aluminum. However, in this decade Australia stopped production of High Speed Crafts because with their high labor cost and the strengthening of their currency they were no longer competitive in the world market. So what they did is they were just selling HSCs in kits to be assembled by the buyer. One of those that took advantage of this was Ocean Fast Ferries. In Mandaue, Cebu, in their own reclaimed land they put up a related company to assemble HSC kits. This was the Golden Dragon Shipyard. In finishing they just drag the near-completed ships using rubber bellows to their shipyard in Labogon where repair works and drydocking is done to the vessels of their other shipping companies. The launching and completion of the new Oceanjets are just done in Labogon shipyard. Out of this process came the sister ships Oceanjet 8, Oceanjet 88, Oceanjet 888, Oceanjet 168 and Oceanjet 188 from 2011 to 2016. Australian engineers came to assist in the assembly of the first kit-built Oceanjet 8 but this took the longest to be built because of the locals’ unfamiliarity (well, the first is always the hardest). These were also high fastcrafts and maybe that helped Oceanjet because there are many passengers who are not comfortable with low-lying crafts like the Malaysian-built fastcrafts. That seems to be one disadvantage of the fleet of Weesam Express. Many passengers get the chills when they see water spray in their craft’s windows. These five fastcrafts followed the same engine template favored by Ocean Fast Ferries which is the 2 x 1,800 horsepower Cummins engines. Again, the speed is not that much at sub-30 knots. But Ocean Fast Ferries guessed well. Nobody was still running at over 30 knots when fuel prices really got high. While fuel is already lower right now still nobody runs at over 30 knots because their engines are already old. They either can’t do it anymore or they are already preserving the engines. And that comes round to one of the strengths of Ocean Fast Ferries – they really have the financial muscle to buy new engines and they can afford to re-engine their old High Speed Crafts, an endeavor that their main competitors SuperCat and Weesam Express can no longer do because of weaker financials. Another show of their financial muscle and the effort to stay ahead of the curb is they are currently retrofitting their fastcrafts to the axe bow which gives more speed with lower fuel consumption. So Ocean Fast Ferries started being the laggard but now their High Speed Crafts are already faster than their competition with its old engines. What a reversal! It is only Weesam Express which try to give them a fight in the speed department and this might be more out of pride and not of technicals. While acquiring these five HSCs built-from-kits, Ocean Fast Ferries also acquired High Speed Crafts offered to them by competition which quit the HSC field. In 2013, they acquired the Paras Sea Cat which already stopped operations. This was originally a Misamis Oriental-built Medium Speed Craft (MSC) capable only of 17 knots with its hand-me-down Caterpillar engines from SuperCat and a heavier hull that was not aluminum. As Oceanjet 9, she was recently re-engined and she is now capable of 26 knots and so qualifying her as a true High Speed Craft. Incidentally, her hull design was copied from SuperCat 26 (later the St. Emmanuel) making them sister ships but Oceanjet will outrun her sister anytime. In 2015, Lite Shipping decided High Speed Crafts is not their cup of tea. So they sold their High Speed Crafts – the Lite Jet 1, Lite Jet 8 and Lite Jet 9 to Ocean Fast Ferries. These became the Oceanjet 11, Oceanjet 10 and Oceanjet 12, respectively. They were re-engined one by one especially the latter whose engines were not that strong after stints in Hongkong and Vietnam. They all can do 25 knots now or better. Golden Dragon Shipyard made alterations to their superstructure including on Oceanjet 9. I do not know but maybe they want a better feng shui or maybe better looks more suited to their taste. Very recently, in 2016, the Lite Jet 15 arrived for them from Japan. This is to be used on their new Tuburan-Estancia route. With a growing fleet, the route system of Ocean Fast Ferries is expanding along with the frequencies. They are doing well and giving all that SuperCat can handle in the premier-for-HSCs Batangas-Calapan route along with the Bacolod-Iloilo, Cebu-Tagbilaran and Cebu-Ormoc routes. Their route system also includes Tagbilaran-Dumaguete and Dumaguete-Siquijor plus a Cebu-Tubigon route that they inherited from Lite Ferries. Recently they also opened a Cebu-Camotes route, a successor of their Goldenbridge Shipping route where once the Golden Express MSCs were sailing. So as of today Ocean Fast Ferries has the widest route network in the HSC field in the Philippines. Right now, July of 2017, Ocean Fast Ferries has a total of 16 High Speed Crafts and all of those have good engines (one will almost never hear of an Oceanjet HSC having trouble while at sea). That is more double the eight HSCs still sailing for SuperCat and even if the third-ranked Weesam Express fleet of seven is added to that, the Oceanjet fleet will still be bigger. Yes, Ocean Fast Ferries or Oceanjet is already dominant in the HSC sector of the Philippines. They did that by continuously adding HSCs over the years and equipping them with good engines always and so their fleet never seems to get old. What is their secret? Many cannot connect that the owning Lua family of Ocean Fast Ferries is simply loaded that they need not take any profits from the operation of Oceanjet and they can simply reinvest all profits. They also don’t have any stockholders to please and so they can take the long-term view. Their main moneymaker is actually the Nature Spring mineral water, the #1 brand in the Philippines. They have a big reclaimed land in Labogon in the Cansaga Bay of Cebu where the Golden Dragon Shipyard is located. This also hosts there Goldenbridge Shipping, one of the pioneers in the fast-gaining RORO Cargo LCT sector. That company also carries their bottled water. Part of Goldenbridge was the old Golden Express MSCs that were once Bullet Express HSCs (they were able to purchase the remains of that company). They are also not new in shipping. Before Oceanjet and Goldenbridge they were already in cargo shipping using trampers. The Lua family owns Unilink Shipping Corporation and Unified Global Shipping Corporation aside from the earlier Socor Shipping Corporation, the forerunner of Goldenbridge Shipping Corporation. In these shipping corporations the Lua family has an additional 15 ships, more or less and that includes some true cement carriers. The Lua family is big in the construction and hardware industry of Cebu and it seems they are also in trading including cement trading. That is the financial muscle of this group most people don’t see. SuperCat is trying to close the gap with two new High Speed Crafts from Austal Philippines in Balamban, Cebu. But I wonder if that will be enough. For some time to come I see Oceanjet reigning in the HSC field in the Philippines. Maybe it’s time for them to make some noise? In the 1970’s and 1980’s (and also the 1960’s) with the support of the National Development Corporation (NDC) and maybe with some “marginal notes” from President Ferdinand Marcos we had a sizable ocean-going fleet (relative to the size of our economy and exports). In the main these were the successors of the ocean-going ships of the 1950s and 1960s that carried extracted natural resources (like logs, lumber, ores) and semi-processed products (like plywood, sugar, copra, coconut oil) outwards and finished products (like machinery, vehicle, spare parts) inwards and some of these were American-owned like Everett Steamship and American President Lines (APL) because US nationals can engage then in local business as if the were Philippine nationals because of the so-called “Parity Rights” inserted by the Liberal Party in our Constitution in 1947. When this special right expired in 1974, we tried to supplant the American ships acting as if locals in the foreign routes and so we increased our investments in ships but then what resulted was probably more ships than we needed. There were three giants in the realm of our ocean-going ships in the 1970s and 1980s and they were obviously the first tier. These were the Philippine President Lines (PPL), Maritime Company of the Philippines and its twin Maritime Overseas Company whose local operations was the well-known Compania Maritima and Galleon Shipping Corporation. The first one also operated the United President Lines (UPL) which had ships chartered from the National Development Corporation (NDC), a government-owned company. Philippine President Lines came earlier in the 1960s and it seems it had special connection too the way they amassed their fleet. Maritime Company of the Philippines came in the 1950’s but really grew when there were already ships available for charter from the Philippine Government and they also availed of that. Meanwhile, Galleon Shipping Corporation only came in the Martial Law years. Of the three, the PPL/UPL had the most biggest fleet. The Philippine President Lines also had local operations like the Maritime Company of the Philippines but they gave it up after a few years. On the other hand, Galleon Shipping Corporation did not sail the inter-island routes. The long-time visible heads of the Philippine President Lines and Galleon Shipping were closely associated with President Ferdinand Marcos then and many thought they were simply dummies and/or cronies. It was not banks that supported their expansion but the National Development Corporation which is owned by the National Government and that is controlled by the occupant of Malacanang Palace. Maritime Company of the Philippines, meanwhile, had Spanish connections and were politically powerful in their own right as one of the owners was a Senator of the Republic. They have also been around since the Spanish times. Second tier of our shipping companies that had international routes in the 1970s and 1980s was probably sole occupied by the Eastern Shipping Lines which is related to William Lines whose owner is politically well-connected also. Their backing were not patsies as they were related to powerful politician clans and they were already long in shipping. But in terms of fleet size and ship size they were far behind Philippine President Lines, Maritime Company of the Philippines and Galleon Shipping Corporation. There were other shipping companies with international routes in the 1970s and 1980s. But relative to the first two tiers they were even smaller and with just a few ships to their fleets. They might be called the third tier but over-all they were no longer that significant in the over-all picture of our international shipping with the probable exception of Universal Shipping which did not last the 1970’s much but they were very significant in the 1960’s. This shipping company was the international operations of the great Carlos A. Go Thong & Company. Among those that belonged to the third tier were Molave Bulk Carriers, Philippine Ace Shipping Lines, Northern Lines, United Philippine Carriers, Philippine Transmarine Carriers, Philippine & Japan Lines, Trans-Ocean Transport, Botelho Shipping Corporation, General Shipping Company, Philippine Maritime Shipping Lines, Seven Brothers Shipping, ASEAN Liberty Shipping, etc. Their routes generally were only in the Far East except for those operating tankers which generally had a westward direction up to the Middle East. If in the 1960s we had routes not only in the Far East but also to the West Coast and East Coast of the USA plus (Western) Europe. In the 1970s and 1980s our international routes were shortened. One reason was the plunge of one our best export then which came from coconut – copra, coconut oil and copra cake. This was due to the rise of substitute edible oils which happened when when a local, government-supported cartel, the UNICOM, tried to drive up the price of coconut oil in the world market, a move that backfired (and to think West Germany warned us that will happen). And by that time our forests were already exhausted by logging, too. The 1970s was also the time that the metallic ores demand nosedived due to the rise of plastics. We were left with not much to export except our laborers (and so we discovered the Middle East market for that). One that cannot be ignored here is when the government took over the tanker business of LUSTEVECO, a locally-based American shipping concern that was affected by the ending of Parity Rights in 1974. From that move and also the taking over of the tankers of the US oil companies operating here like ESSO (a company which was known in the future as Philippine National Oil Company or PNOC) a local tanker fleet plying the international waters was born under the flag of the PNOC Oil Carriers Inc. The government did that to secure our oil position because then the demand in oil exceeded supply and securing of supplies was essential to prevent supply disruptions and the shooting up of local oil prices. In size, this tanker business of the government in the 1970s and 1980s was big enough to land it in the second tier. The government also created the National Maritime Corporation (NMC) which was in general cargo. Again the rationale is to secure our supplies and exports. In size NMC was even better then than many of the third tier shipping companies. Again the National Development Company (NDC) financed the development of its fleet. It could have been a good move also because previous experience showed chartering of NDC of its vessels to private shipping firms in many ways resulted in them holding the empty bag when these companies folded. That means freighters that are not sailing and there were no interested takers and in many cases that resulted in ships being sold to the breakers at a loss since NDC is not into shipping. Actually it was the first tier overseas shipping companies which wer the biggest contributor to the “empty bag” when their operations collapsed at the height of the Philippine economic crisis of the 1980’s. Later, when the NMC was also losing and it was sold by the government under the privatization scheme and it landed under the control of the Magsaysay Shipping Group. To illustrate the size of our ocean-going fleet then I will the list the fleets of the first tier. The Philippine President Lines acquired the Philippine President ships earlier between 1960 and 1961. The National Galleon Shipping Corporation just survived a few years more the crisis years of 1983-86 than Philippine President Lines and Maritime Company of the Philippines. But all went down in those crisis years. Those crisis years at the tailend of the dictatorship of President Ferdinand Marcos was the deadliest for Philippine shipping and even worse than World War II because the lost ships in that war were replaced by the USA after they requisitioned them or had them scuttled. In the latter years, it is only the WG&A fleet (combined passenger and cargo) that can rival the fleets of any of the first-tier overseas shipping companies in terms of total Gross Register Tonnage (GRT) , the classical method of comparing fleet sizes. When President Cory Aquino ascended into office there was great lack of foreign currency and capital in general because of the relatively profligate administration of President Ferdinand Marcos and the leaks in the national budget. We were then in tight reins of the International Monetary Fund (IMF) and we have to pay 25% of the national budget to our lenders. There was really no more money to support these dinosaurs who wer already behind in the paradigm change to container shipping. Ironically, when the overseas shipping companies supported by the government all collapsed, it was the local lines that had containers ships remaining from the likes of Aboitiz Shipping Corporation, William Lines Inc., Sulpicio Lines Inc. and Lorenzo Shipping Corporation but their operation was only inter-island. It was only Aboitiz Shipping that had an international route with their Aboitiz Overseas Shipping Corporation (AOSC) and Eastern Shipping Lines vessels also carried a few container vans atop their cargo ships. Ironically again, some of the ships seized by the National Development Corporation in the fleet of Galleon Shipping were converted into container ships of when it was sold to Uniglory Marine Corporation of Taiwan. These were the Galleon Opal, Galleon Sapphire, Galleon Topaz and Galleon Amethyst. When our ocean-going fleet was dying the likes of South Korea, Taiwan and Singapore wer testing the business of international container shipping with government support. Now their container shipping lines are all world-ranked while we don’t have a single overseas container line. If there was a reversal of fortune then this is it. And it also showed how from being one of at least an average economy we became “The Sick Man of Asia” whose shipping fleet is laughable now by the standards of its once peers or near-peers. We don’t have international shipping lines anymore and so all we do now is export our mariners and call them “heroes” but treat them shabbily for most times and require a lot from them. And that is practically the story of our international shipping for the past half century or so. The longest route after the war was the Manila-Cebu-Tagbilaran-Dumaguete-Zamboanga-Dadiangas-Davao route which was around 1,000 nautical miles in distance and which took up 6 days to cover. Some of the ships on this route actually still called in one or more ports (like Dipolog), some with less and in earlier days it was Maribojoc port on a nearby town which they used in Bohol. Most of the ships that plied this route in the first two decades after the war were former, converted “FS” ships with a sprinkling of ex-“C1-M-AV1” ships. The first was much smaller than the but both were surplus cargo ships during the war which were only capable of 11 knots at most which made for a languorous voyage. 11 knots is actually the speed of the cargo ships of today (and even of old) and their speed actually betrayed their cargo ship origins. The ships plying the route takes nearly two weeks to be able to return to Manila. So to be able to offer a weekly voyage on a specific day, a shipping company should have a pair of ships sailing the route. When one is leaving Manila, the other will then be leaving Davao and they will cross path somewhere in Mindanao Sea if one is not delayed (the weather is one particular source of delays then because the ex-”FS” ships need to look for shelter when the weather acts up and roils the seas). Long routes, if there are not enough rest for the engines on inter-port calls can be murderous for the engines. Of the two types most used here it was the former ex-”FS” ships which lasted longer and it outlasted the ex-”C1-M-AV1” ships. One reason maybe is because the latter is equipped with one engine only while the former had two and it had an electromechanical transmission (which meant less maintenance). Ex-”FS” ships generally lasted about 4 decades of service here before giving up. The were practically the “jeep” of the sea. The leading shipping company then which was Compania Maritima had the luxury of using passenger-cargo ships from Europe in this route which were the almost-new MV Jolo, MV Cebu and MV Panay. Those ships were faster and had more passenger conveniences aside from being big. Two of their competitors which were William Lines and Carlos A. Go Thong & Company were only able to field former passenger-cargo ships from Europe to this route only in the late 1960’s. When those arrived Compania Maritima began deploying newer, bigger and faster ships from Europe like the MV Filipinas, MV Luzon and MV Visayas. This route was really important then to the leading shipping companies and the route provided good load and high passenger load. One reason is the opening up of Mindanao for exploitation (in the real sense!) and the consequent coming of outsiders to the then-undivided Cotabato and Davao provinces. This route was their link to Cebu and Bohol. And this route was the artery of goods to and from Manila. While this route could be murderous for the engines and taxing for the crews, I noticed that the shipping companies which stuck to this route lasted longer than the shipping companies that mainly did the Visayas routes only. Since passenger-cargo ships mainly carried the cargoes in those day and cargo is the bread and butter of shipping having a long route passing through more ports was more advantageous. Among the notable shipping companies then which did not try this route and did not last were General Shipping Company and Southern Lines Inc. Many shipping companies tried this route right after the war especially the bigger shipping companies. This route was not for the smaller companies because to do this route they must have enough ships because the ships won’t be at port again before two weeks. Some of the earlier ones did not last like Manila Steamship of Elizalde y Compania which quit shipping after the loss of their flagship. Another was De la Rama Steamship which left the local routes to concentrate on ocean-going routes. Compania Maritima was the one which bet early in the route and they had the muscle to dominate the route. Among the others it was William Lines which tried to match them and since its fleet is not big it assigned almost all of their ships to this route and all of them were just ex-”FS” ships. But such was the belief of William Lines in this route (well, being a power too in Cotabato especially along Dadiangas which is General Santos today was also a factor for sure). Philippine Steam and Navigation Company (PSNC) also did this route but their commitment was inconsistent and they eventually withdrew from this route. But they and its successor Aboitiz Shipping Corporation were the ones which experimented on different wayports to reach Davao. Just like what Sweet Lines did later. Carlos A. Go Thong & Company also perservered in this route starting the mid-1950’s when they became a national liner operation. When the former passenger-cargo ships from Europe started arriving for William Lines and Carlos A. Go Thong & Company (and also to upstart Dacema Lines) in the late 1960’s, the ex-”FS” ships of this route were slowly relegated to shorter routes although that type was still used in this route up to the late 1970’s. By that time they were functioning more like cargo ships already and as carrier in the inter-port routes. In the Philippines which has no tradition of sending ships to the breakers until it is no longer capable of sailing, it also meant still trying to find a role for these old but sturdy ships. The nature of this route started to change in the middle 1970’s when a new type of ship arrived, the fast cruiser liners. This new type ambitioned to have weekly sailing and so it tried to make the voyage to Davao in just three days or even less. To make this possible the number of wayports where they will call was drastically cut back and that is just to one which is Cebu port. So for the new fast cruiser liners the route suddenly shrank to just Manila-Cebu-Davao (and that practically torpedoed the old route since passengers no longer want to be cooped in ships that long). I think this was also the reason and situation why Iloilo suddenly became “the” wayport to Davao instead of Cebu. The route is shorter and it still afforded a call to Zamboanga which was difficult for a ship calling in Cebu. With the fast cruiser liners, the old ship and route did not go away entirely immediately. Actually the old ships and route served as adjuncts but as if it is the “second class”. Another alternative and adjunct-competitor was the arrival en masse of a new type of ship, the container ships which began to multiply starting in 1979. Many were of the express type and it either sailed direct or with just one wayport. Slowly this type killed the old, slow passenger-cargo ships and in 1980 and 1981 a lot of them were already laid up. The selling point then already was the speed of shipment and the security afforded by the new container vans (in terms of protection against pilferage and damage in handling and because of the rains). For the passengers they no longer wanted a 6-day voyage even though they were fed the entire way. In the 1980’s, this old longest route was practically gone already with the forced retirement or reassignment of the ships which once sailed the route (actually the ex-”C1-M-AV1” type was gone earlier when its engines gave up in the 1970’s and many were simply sent to the breakers). The main carriers, the ex-”FS” ships were also on their last legs and getting more unreliable and no longer suited for this distance. Now that long route is just a distant memory. But the passengers and shippers relying on it in the inter-port routes suffered and has to take other means of commute or shipping and that sometimes meant the uncomfortable bus. This is a route that will never come back (and gone was the free tourism associated with it). Well, things change and times change too. Very recently, the Southwest Maritime Group of Companies (SWMGC), which is owned by the loud Arben Santos and previously was into crewing, technical ship management and ship husbandry created the Southwest Premiere Ferries Incorporated or SPFI. Under it was the first vessel of SWMGC, the ferry SWM Stella del Mar which was financed through a P550 million loan from the Philippine Business Bank. I salute them for the guts in launching a completely brand-new ship in a distant route route and I wish them well. The SWM Stella del Mar is a sister ship of the brand-new series of short-distance ferry-ROROs of Starlite Ferries Incorporated which are now plying the Batangas-Calapan and Roxas (Oriental Mindoro)-Caticlan route and has announced plans to operate a ferry in Ormoc City. SWM Stella del Mar is not only a sister ship to the new Starlite; she was also built by the same company in the same shipyard in Japan. The SWM Stella del Mar was built by Kegoya Dock in Japan, just this year of 2017 with the IMO Number 9798521. The ferry measure 66 meters by 15 meters with a gross tonnage of 2,711 and a deadweight tonnage (DWT) of 907. The press release says 21 trucks can be loaded. She has the declared cruising speed of 13.5 knots although like her sister ships, she might be capable of speed up to 14.5 knots, if desired. She has an advertised draft of 2.9 meters (that is not a deep draft if true). The draft is the vertical distance between the waterline and the bottom of the hull on the outside. The ship is claimed to have a large draft (is that true? )and that aids the stability of the ship. That is a plus factor for safety in the sometimes-turbulent seas of the country. But then that might not be tested because our weather agency PAGASA and the Philippine Coast Guard suspend voyages of local ships sometimes even before a tropical depression system manifests and called it a “gale” (Philippine “gale” which is much tamer than the English gale). When suspensions of local ships happen the foreign ships traversing our territorial waters continue to sail (well, they have the advantage of INMARSAT which is not common in Philippine ships). However, a large or deep draft is not always a positive because it means there is a large depth, the minimum measure of water depth needed for a ship to pass a certain body of water. That means in shallower seas the ship might ground and there are many portions of our seas like that. There are also shallow ports made more difficult because we normally don’t do dredging of ports. So when the winds act and swells appear a large draft is good but if it is calm, normal seas it can be a disadvantage. The SWM Stella del Mar is a big ship. It is not a basic, short-distance ferry-RORO. Actually she is bigger than many overnight ship and if fielded she will be the biggest vessel (but not by a large margin) in the eastern seaboard of the country. By comparison she is approximately the size of the Trans-Asia 8 and actually the two share external design similarities if one will notice. In size, she is bigger than the former Tamataka Marus here and two Montenegro Shipping Lines and examples of those that served the eastern seaboard are the Reina Emperatriz and the Reina Genoveva. She is also bigger than the “Orange” sister series from Tokoyuni Industries that came here like the Anthon Raphael, Super Shuttle Ferry 18 (which both served the eastern seaboard) and the Maria Ursula and Reina del Cielo of Montenegro Lines. She is also bigger than the former Asia Japan which is the Nathan Matthew now and also bigger than the sister ships Maria Felisa and Maria Vanessa which serves the Benit-Surigao route for Montenegro Shipping Lines. Well, to compare, she is even than the Jack Daniel, the biggest ship of Sta. Clara Shipping Corporation. Actually, the SWM Stella del Mar is bigger than some overnight ferries like the Filipinas Dapitan and Filipinas Dinagat, the Lite Ferry 10, Lite Ferry 11 and Lite Ferry 15, the Asia Philippines and the former Calbayog (now the Staarlite Neptune). She is approximate in size with the Oroquieta Stars, Graceful Stars, Joyful Stars, Wonderful Stars, Lady of Good Voyage, Trans-Asia 2 and Lite Ferry 8 (the seven are a little longer but “thinner”). With that maybe, one familiar with those Cebu ships will have a good idea of her size. Well, her size is actually Cebu overnight ferry range and bigger than the overnight ferries of Zamboanga. My first concern is the Surigao-Liloan route is not strong like the Batangas-Calapan, Roxas-Caticlan or Matnog-Samar routes where a lot of vehicles and passengers cross including sedans, AUVs and SUVs of local tourists or those who bring cars home on visits. That is not the nature of the passengers that cross Surigao Strait and vehicles here are already fewer than the three sea crossings mentioned earlier. If there are passengers in the Surigao Strait crossings those are most likely passengers of the buses and so in order to capture them the buses have to be captured first and that needs heavy discounting and “rebates”. The Surigao Strait crossing is experiencing a tight market in the recent months (of course, in peak season it might always be full or near-full) as FastCat entered the route with two or three round trips a day (three when there were still 2 FastCats there) and that took market away even from the rock-solid Montenegro ship in the Benit-Surigao route that offered many schedules and which offered the lowest rates because of its short distance (but in per nautical mile, they are much more expensive). The other ferries in Lipata suffered as well especially since there is a Cargo RORO LCT, the GT Express 1 (which has also difficulty on lean days and might not survive except in peak months). Gone from this route was the kilometer-long queue experienced during the peak seasons. Now the SWM Stella del Mar will come into that market. In that market it is not the question which is the newest as the passengers and the vehicles not contracted will usually take the earliest ferry unless there is the chance that the faster next ferry will overtake the earlier ferry. But in this route the two-hour gap between departures is usually observed and so overtakes are not frequent. I myself might take the earlier ferry if the next one is still two or three hours away. The SWM Stella del Mar might have some advantage in speed but it seems her transit time will just be 30 minutes faster. But not against FastCat which is much faster than her at 17 knots. She will have no competitive advantage against the FastCat because this is also a new ferry with good SOPs and good passenger service. Well, their guy assisted us all the way in Liloan last December and all we had to do was wait and we didn’t need to queue up. Anyway many trucks and even the buses here are already “locked” which means they are tied to a particular shipping company. And for being a regular or suki they enjoy discounts on the rates and even “rebates” in form of tickets and even cash. This is the system or the game that is rampant in the eastern seaboard (except for the treatment of FastCat to Philtranco and its drivers who have no option but to load with FastCat because the two companies have the same ownership) and I don’t know if Southwest Premiere Ferries is willing and ready to play this game to the hilt. They announce that with their speed they can ply the route several times a day. Well, if they don’t know it yet, their competitors speeds can also do that but they don’t because there is not enough load Well, even on the much shorter Matnog-Allen route which has less than a third of the Liloan-Surigao route, the short-distance ferry-ROROs there only do two complete voyages in a day, normally. In this Surigao Strait crossings, it is the buses that can fill in the seats if they are many but they are not (in San Bernardino Strait some 75 or so buses will cross in a day in just one direction but in Surigao Strait the figure is only about 15). The Surigao Strait crossing is nowhere near the San Bernardino Strait crossing in traffic even in trucks. And in Mindanao the passenger and cargo liners are not yet defeated unlike in Eastern Visayas and Bohol. Now can SWM Stella del Mar fill her vehicle deck? The passenger capacity of the ferry is also much higher than the competition’s at nearly 1,000 persons. I wonder where will they get the passengers for that. Well, it is a 3-hour crossing and usually passengers in that crossing have already hours of sitting inside a vehicle. I just hope the seats of the SWM Stella del Mar are also good for lying or sleeping in. “a. 2.75 meter easement–the space between the accommodations and the outer rails. It can accommodate all passengers on one side during emergency situatons. b. 1.2 meter wide stairs–to prevent crowding if there is ever a need for evacuation. Water tight cargo hold–to prevent the ingress of harmful salt water that may damage onboard cargo. This also prevents water from building up. Bow thrusters–thrusters on the side of the vessel allow it to maneuver better despite strong currents. This also makes the vessel effective during search and rescue operations. An easement between the passenger compartment and the outer rails is common among ships. It is not an advanced feature and that side is not the muster station where passengers should congregate before evacuation or abandoning ship. Actually that area is the section where it is difficult to launch automatic life boats. The safest area for abandonment of ROROs is actually the ramps of the ship since being near the water already there will be less injuries compared jumping from the side of the ship. 1.2-meter wide stairs. Well, I have seen many stairs that are much wider than that. Actually that is a narrow stair. Watertight cargo holds are a common feature of ships. There is nothing modern there. That has been a fixture of ships for so long now and even in antiquity (if the holds are not watertight then the ship will simply sink). If water builds up in the bilge of the ships which is below the holds, there are pumps to draw out the sea water. There are many ferries now that have bow thrusters and that was already common decades ago. Usually it is only the smaller ferries including the basic, short-distance ferry-ROROs that do not have that. What is even more interesting to me is a hydraulic, three-piece ramp which is a big aid in the ingress and egress of vehicles in high or low tide situations. Inspecting the photo of the stern of SWM Stella del Mar it seems she is not equipped with that. The smaller and older Lite Ferry 10 has that feature. NAVTEX receiver, AIS transponder, GPS navigation and BNWAS. NAVTEX is not advanced and it just relies on the forecast of the host country which in this case will be the notorious PAGASA. If they mentioned INMARSAT, I might have been impressed. AIS transponders are so common now. All MMSI ships have that and there are ships built in the 1970’s that have been retrofitted with AIS transponders like Warrior Spirit, the incoming third Trans-Asia of Trans-Asia Asia Shipping Lines, Incorporated (keel laid down and launched in 1979, completed in 1980). GPS navigation is also the standard now (no more compass and even the smartphone can give the one the coordinates and speed). But did they mention autopilot, automatic docking system and joystick instead of wheels? Nope. Those equipment are more advanced that the simple GPS. China-built regional container ships that dock in Davao have such equipment. BNWAS which is Bridge Navigational Watch Alarm System is good which sounds an alarm if the deck watch officer falls asleep but it might not really be necessary here. Ships here have too many cadets on board that I have never ever seen a bridge that has just one crewmen at any moment, the ship running. They can sell the BNWAS and it will not make a difference. Too easy to assign so many cadets that the deck officer does not even man the wheel. Oh, by the way, the FastCat is equipped with joysticks and I think it has ECDIS (Electronic Chart Display and Information System) which was never mentioned in the SWM Stella del Mar press release. Well, even the old, gone SuperFerry 19 which was built in 1977 was retrofitted with that equipment. I find their press release in bad taste. It is just to fool people and make them good in the eyes of the unknowing public (but not the ship spotters and mariners). That should not be the case. Of course the ship is IACS (International Association of Classification Societies). Well any national classification society which is a member of that becomes IACS-certificated but not the Philippines because MARINA is too low in quality to qualify for that and it can’t even inspect ships well. China is even a member of IACS. SPFI is hoping MARINA will phase out 35 year old ferries. Yes, MARINA (Maritime Industry Authority, the local maritime administrators) has such a plan and it called for a meeting with shipping companies and shipyard owners. I have an update on what transpired there. The Cebu shipping companies came with their lawyers. When MARINA said they plan to phase out 35 year old ferries, the lawyers asked if MARINA has any study that shows age is a factor in accidents. MARINA admitted that it has none and it ended with a “Noted” (which means they have no answer) from MARINA. MARINA also want ships classified with IACS (International Association of Classification Societies). My informant says MARINA seems to be washing its hands because they themselves cannot do it and so they want our ships and shipyards accredited by a foreign body. Again, there was an objection and it also ended up in “Noted”. Aside from that they want the shipyards to be ISO-certified. Well, shouldn’t be MARINA the first one to be ISO-certified? Nothing came out of that too, said my informant. So don’t believe just yet some of these things that are published in our papers. Arben Santos and Alfonso Cusi of Starlite Ferries really want to phase out old ships coz they wanna clear out the competition and have the field for themselves. Oh, by the way the vessels of Star Ferry of Hongkong are already 55 years old on the average and those are still sailing well. Arben Santos says their ferry will be cheaper by 30% to operate. Well, if he gives 30% discount on rates he might be able to clean up the the competition without resorting to administrative fiat. But what if the competition responds? He still has to pay for his ships while his competition already have their ships paid for except for FastCat. Now that bird even has lower fuel consumption than his ships while being faster because it has a light hull and is a catamaran. He can’t beat that. It simply can sail even without being too full and the Philtranco passenger buses and cargo buses are within its fold. If I am observing FastCat I am also doing the same for the SWM Stella del Mar. I wanna see if they have the right ship, the right route and the right strategy. I also wanna see if Arben Santos can back up his expansive words. Actually, I don’t like people stepping on the toes of their competition just to promote their product. That is not fair. They say them competition only runs at 8 knots. That’s a very funny and a ridiculous lie. Can’t they think of a better promotion spiel? It has been several years before I was able to go back to Bicol where I grew up. My planned trips in 2013 and 2014 were aborted for various reasons and 2015 was a difficult year for me to travel. So I resolved that when I am able to go back to Bicol I will visit the Albay ports especially since it has been some time that someone was able to cover it for PSSS (Philippine Ship Spotters Society). My targets in Albay were the ports of Legazpi and Tabaco (these are the two main ports of the province). I was not sure I can go to the new port of Pio Duran as it is out of the way and I just reserved a possible visit there when I go back to Cebu via Masbate. Regarding the Mayon Docks in Tabaco City, we have a member there who might arrange access for me but I was not sure if I will have enough time before it gets dark (that is always the problem with long-distance shipspotting especially in rainy weather). Well, I was not even sure if I have the time to visit a PSSS founder based in Tabaco, Edsel Benavides. After one breakfast, I rode a bus to Legazpi. It was already better this time because the bus trips going there were again back in the two-and-a-half hour range (no more “Station of the Cross”). I first spent some time in the Legazpi bus terminal as I have to take pictures of the buses too as I am also a bus spotter. That is when the rain that was threatening fell. In my trips last Christmas starting from Allen before going to Bicol I almost always had an umbrella. It was the peak of amihan which means the peak of rains too for the lands facing the Pacific Ocean). I was able to reach Legazpi port in time. I said this because the motor bancas for Rapu-rapu and Batan islands have not yet left. That was unlike the last time I was there when it was already afternoon (and with a much heavier rain to boot). I noticed there was a new and modern-looking port terminal building with a lot of glass (I just wish it is designed for a super-typhoon). There was also many freighters when I came visiting. They are docked in the refurbished wharf for freighters. It on the motor bancas and the inside of the port terminal building where I concentrated. I have not yet covered well for PSSS the big motor bancas of Legazpi. In a sense, they are just like the big motor bancas of Masbate and Surigao. They will take in nearly 100 passengers and a lot of their cargo, one of the reasons for the outside walkway that is part of their design. The swells were a little high. Boarding needs some care lest one be thrown overboard. No need to ask how it is farther. The hawkers were also vending “Bonamine” and “White Flower”. I no longer walked towards the freighter pier and preferred instead to just take long-distance shots, for two reasons. One is to conserve on time as I still have a lot of places to cover and second, the freighters in Legazpi are also freighters that can be caught in Cebu or in other ports of the country. Of course the drawback is sometimes my vantage point is not good and I cannot individualize the ships. One notable ship there, however, was a big coal barge, the Highline 55. Maybe the cargo is intended for the cement plant in Camalig town. It was Malaysian with a Malaysian tug (the Highline 56). The Embarcadero de Legazpi is is also in the same port area but I did not try to visit it anymore for the same reason of conserving time. I just took shots of it from the port. But I just noticed the zip line is already gone along with the boats for Misibis. Embarcadero de Legazpi, aside from being a mall is also a tourist spot is also a flagship development in Legazpi City. Its boardwalk was beautiful in the past (but then a strong typhoon has just passed). I did not stay long in Legazpi port as the motor bancas were already preparing to leave and another reason is I was not too comfortable as the wind was a little strong. It seems it is sucking my lungs and I am no longer used to that feeling. Besides, I also have to go to the old train terminus of Legazpi to see what is the recent situation there. When I shipspot I also take into consideration the wishes of the other PSSS members whose primary liking is rails or bus. I was doing a favor to one of our railfan-member who gave us a lot of ship photos from the past (he is Lindsay Bridge, a rail engineer once assigned to PNR by AusAid). From PNR Legazpi Station I took a simple jeep ride to Tabaco. It was a gamble for it can take me longer. On the other hand I have a front seat and that always trumps other considerations (the need to take photos and be able to view the road is always primordial). But it became a good bet as no bus overtook us anyway and I had the chance to throw questions to the driver (he only charged 1 peso per kilometer – Bicol is a deregulated area unlike Mindanao where fares are high because of a monopoly). The only negative was the heavy rain in almost my entire ride. Well, typical amihan weather in the northern coast of Albay. Funny, in reaching Tabaco my first visit after a short walk in the city center was to the bus terminal. I wanted to catch the buses of Tabaco and I reasoned the ferries from Catanduanes have not yet arrived anyway. From the bus terminal I then proceeded to Tabaco port and it was raining hard again. First, the padyak driver went to the fish landing area but I waved him off as I can also cover that from the inside of the port (the fish landing area and the port are divided by a high wall so there is no direct access). It was not difficult to enter Tabaco port although it is supposed to be an ISPS port being the former regional port (the new regional port which Pantao port, Governor Salceda’s white elephant, is just a regional port in name as almost nothing docks there). However, as a short-distance RORO port, people arrive at almost any time, it is the bread and butter of the port and so they do not just shoo away people unlike in ISPS ports where the guards think their port is a fort that must be “defended”. As usual, there was a Regina Shipping Lines (RSL) basic-short-distance ferry-RORO inside Tabaco port. It was the Regina Calixta-II. The RORO left is supposed to be the first trip at dawn in the next morning (there are no afternoon trips to Catanduanes as many passengers are still bound to the other towns and darkness will overtake them). She is also supposed to be the first ferry out of Catanduanes. Regina Shipping Lines does exclusively the Tabaco to San Andres, Catanduanes route now through Codon port while the sister companies Sta. Clara Shipping and Penafrancia Shipping exclusively do the Tabaco to Virac, Catanduanes route. The ferries from Catanduanes have not yet arrived when I was there as their ETA was about 4pm or so as their ETD in Catanduanes is about 12nn or 1pm. These ferries will be laden with buses bound to Manila for sure along with its many passengers. However, just outside the port gates of Tabaco were three more buses for Manila waiting. Those will be for the ship passengers that are without rides yet (I was tempted to ride them at first thought but decided against it since leaving late will allow me no further view of the road). I visited the inside of the port terminal and the atmosphere there was easy and welcoming. The ticketing offices of the ferries were there along with a slew of passengers that will be staying there for the night to board the first ferry at dawn (one was actually a white married to a local). I was heartened by that because it reminded me of the hospitality of the old ports in the past before the arrival of ISPS (International System of Port Security) which tried to kill such hospitality. In the past, passengers who were left out or were too early for their trip have the comfort of the thought that they can stay in safety in the port or in the ferry that will be the first to leave. Sometimes I think the “I” in ISPS actually means “Inhuman”. There was something new inside the port, I noticed. There was a tarp and the ticketing office of one Cardinal Shipping. I thought was, this the pioneering shipping line that first fielded ROROs in the Sorsogon-Samar route three years ahead of Maharlika Uno? Their vessel was a catamaran named Silangan Express 1. I was told that cat was actually a local-built (in Cavite perhaps?). It offers a one-and-a-half hour ride to Codon port versus the usual 4 hours of the short-distance ferry-RORO. Their fare is actually cheap and so it was a good proposition. It only started operations last October and it is the last trip out of Tabaco for Catanduanes. I walked the length of the port when the rain subsided. I noticed in the back-up areas two trucks chartered by Oxfam, the international relief agency. I was glad. A Filipino high up in their local operation was an old friend. And then there were the freighters of Tabaco. One thing I noticed in Tabaco is the freighters will usually be actually Tabaco-based. If there are Bicol freighter operators they are based in Tabaco and not in Legazpi although at the stern of the ship the place of registry will be “Legazpi ”since registrations are based where the regional office of MARINA is. Now, why don’t just they affix the place of where the operator is based? Isn’t there more truth and justice in that? On that day, only the freighters Lander Dexter, Christian Edward and Drake were there. The latter belongs to the Premship group of Cebu, however. There was also a barge whose livery says it is a Michael Ellis which is an Albay shipping company too. It is supporting an expansion of the port. Actually, the last time I was in Tabaco port they also had some expansion/refurbishment going on and I can see in the port road the result now. From a distance the Mayon Docks which is also in Tabaco is visible (this is the only big shipyard in Bicol). It will have to be long-distance shots since the linear distance is about two kilometers. Recognizable there was the Star Ferry-III of 168 Shipping Lines with its hump near the bow. This ferry does the Matnog-Allen route. Partially covered there is what turned out to the former Maharlika Cuatro which was bought and sold by Gabisan Shipping. It is now the Regina Calixta VI of Regina Shipping Lines according to a report of our member in Mayon Docks. [Both ferries are sailing now as of the time of the writing of this article.] There were also freighters for refitting in the shipyard as usual and a big LCT. From an area almost enclosed by the port was the fish landing area (FLA) and on the other end was the fishport of Tabaco. Mostly it was small fishing bancas that were there which fish mainly in Tabaco Bay. There were also motor bancas bound for San Miguel island that almost encloses and is part of Tabaco. I did not stay long in Tabaco port, too. First, the weather was not really inviting and I planned not to go back to Legazpi but instead ride a Sabloyon road jeep direct to Ligao City. I really can’t tarry because i might miss the last Sabloyon jeep and this was the reason I can’t wait for Edsel to finish his office work. I was hoping I can see again that road and also see the damage of the recent typhoon like what I did in the earlier portion of my trip. It was front seat again in a basically jeep that does not leave unless it is full (however, it did not take long to fill up because there were students; I barely had time to buy hamburger from a roadside stand for I have not eaten lunch yet to save on time). It was heavy rains all the way along Sabloyon road made dangerous in some places because of the wash-outs caused by the recent typhoon. I reached Tuburan junction of Ligao City in due time but there was an unexpected problem – the buses were all full. I just took my time getting shots of Manila buses and conversing with some local to get updates. I was however able to board a bus before it got dark. Funny, it was the same bus I took on the way to Legazpi City. Soon it was dark and still raining hard. I thought, typical amihan weather. I covered nearly 200 kilometers in such kind of weather that day. My shots? Some were awful. But it was good shipspotting anyway. And good railfanning and bus spotting too.